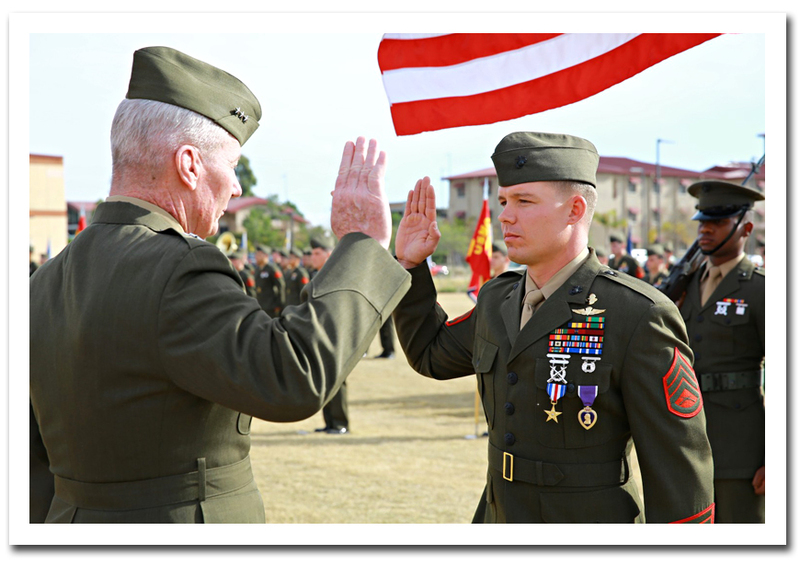 Lieutenant Gen. John Toolan, commanding general of I Marine Expeditionary Force, oversees the reenlistment of Staff Sgt. Timothy Williams, a section leader with 1st Reconnaissance Battalion, during an award ceremony held at Camp Las Flores, Marine Corps Base Camp Pendleton Calif., Jan. 7, 2014. Williams, a native of Hudson, Mich., was awarded the Silver Star Medal and Purple Heart for his heroic actions in Afghanistan when he maintained a tactical advantage while being ambushed by a larger enemy force. Williams helped save the lives of multiple Marines and destroyed several enemy positions during the 10 hour attack. This entry was posted in Photos and tagged 1st reconnaissance battalion, afghanistan, ambush, award ceremony, camp pendleton, military photos, photo friday, purple heart, reenlistment, silver star, staff sgt timothy williams, timothy williams, united states marine corps, us marines, usmc. Bookmark the permalink.